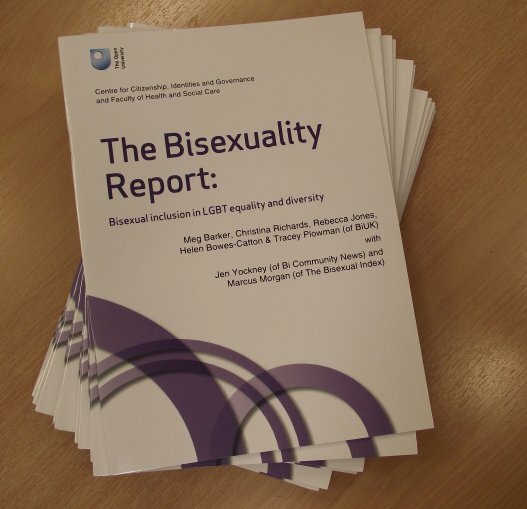 On February 15th, 2012 BiUK - in collaboration with the Open University - launched "The Bisexuality Report"
Bisexual people are included in the acronym LGBT but often our issues and circumstances are not separately understood in practice. This is despite clear evidence that we experience discrimination in education, in society, and in the workplace and that we are more at risk of mental health problems than lesbian, gay, or heterosexual people. Bisexual people are subject to a specific form of discrimination - "biphobia" - because we do not fit the simplistic "you're either gay or straight" model of sexuality. This in-depth report summarises national and international evidence and draws out useful recommendations for future bisexual inclusion in many different settings. Written by BiUK, with Bi Community News and The Bisexual Index, "The Bisexuality Report" and its recommendations have been endorsed by Stonewall, The Lesbian & Gay Foundation, and the College of Sexual and Relationship Therapists. We’re delighted to endorse this report, which builds on Stonewall research looking at the distinct experiences of bisexual people. Bi people will be pleased to know that researchers really do understand their needs. Now it’s important for service providers, the media and employers to take those needs seriously – we hope this important work helps them to do that.